The land conflict between Suku Anak Dalam Bathin Sembilan and PT. Asiatic Persada had occurred since 1987. This conflict occurred because of PT. Asiatic Persada has occupied 3.550 hectares of Suku Anak Dalam Bathin Sembilan’s land. This paper will analyze how the movement of Suku Anak Dalam Bathin Sembilan who lived in Bungku Village, Batanghari, Jambi to struggle their land. This study uses the social movement theory that explains three phases of movements, such as the interest phase, the protest phase, and perspective phase. The author uses a qualitative method and the data are taken from interviews and literature study. This study found that the beginning movement of Suku Anak Dalam Bathin Sembilan was very intense with the support of local and international Non-Governmental organizations, then the movement built a sustainable strategy in the protest phase. Unfortunately, that strong movement has split into two in the perspective phase. PRATIWI, Tiffany Setyo. Understanding the Movement of Suku Anak Dalam Bathin Sembilan Against Land Conflict with PT. Asiatic Persada in Jambi Through Social Movement Theory. TRANSBORDERS: International Relations Journal, [S.l. ], v. 2, n. 1, p. 1-12, dec. 2018. ISSN 2598-9200. 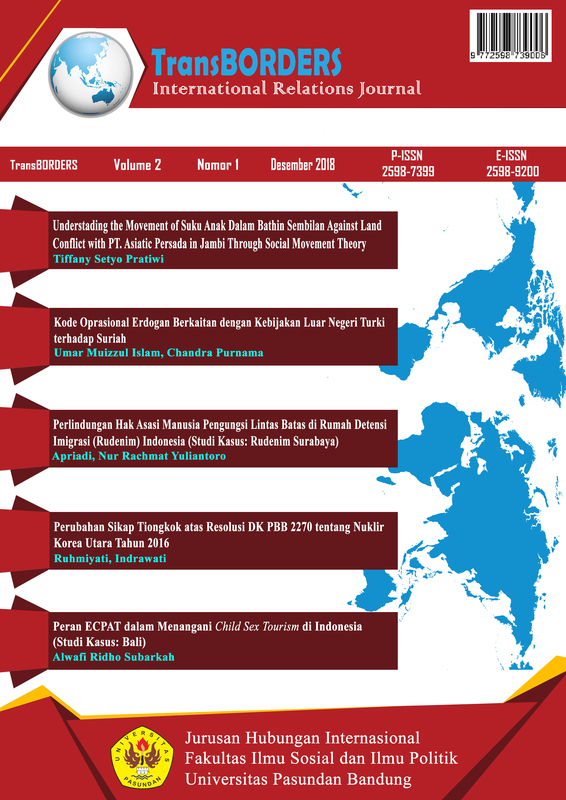 Available at: <http://journal.unpas.ac.id/index.php/transborders/article/view/859>. Date accessed: 18 apr. 2019. doi: http://dx.doi.org/10.23969/transborders.v2i1.859.